In the battle against cancer, one of the main technologies used for treatment is chemotherapy. Chemotherapy is the use of chemicals to destroy cancer cells. Chemotherapy works by interfering with the cancer cell’s ability to grow. It is one of the three main methods utilized to treat cancer. Radiation therapy and surgery are also employed; both of which may be used in conjunction with chemotherapy. What makes chemotherapy very effective, is that it has the ability to treat widespread (metastatic) cancer, that is in more than one location in your body. This ability makes chemotherapy very important in a patient’s fight to overcome cancer, because radiation therapy and surgery are only suitable for treating cancer in localized areas. When these three treatments are used in conjunction, their complimentary avenues of attacking the disease frequently offer the patient the best chance to beat cancer. There are many different types of drugs that qualify as chemotherapy agents, and the drug that is chosen is dependent on what type of cancer will be treated. The drugs are classified into five major categories based on the way the drugs affect cell chemistry, and which stage of the cells life cycle the drugs effect. To understand chemotherapy, the cell cycle must first be understood. Chemotherapy is effective because the drugs used effect some phase of the cell life cycle. Each cell goes through a four phase cycle in order to replicate itself. The first phase called G1, is when the cell prepares to replicate its chromosomes. The second stage is called S, and in this phase DNA synthesis occurs and the DNA is duplicated. The next phase is the G2 phase, when the RNA and protein duplicate. The final stage is the M stage, which is the stage of actual cell division. In this final stage, the duplicated DNA and RNA split and move to separate ends of the cell, and the cell actually divides into two identical, functional cells. Damage the DNA of the cancer cells so they can no longer reproduce. This is done by altering the DNA structure in the nucleus of the cell preventing replication. During the S phase of cell life, inhibit the synthesis of new DNA strands so that no cell replication is possible. This occurs when the drugs block the formation of nucleotides that are necessary for new DNA to be created. Stop the mitotic processes of the cell so that the cancer cell cannot divide into two cells. The formation of mitotic spindles is necessary to move the original DNA and the replicated DNA to opposite sides of the cell so the cell can divide into two cells. Current chemotherapy drugs will act in one of these ways to achieve the ultimate goal of killing the cancer cells in the body. The drugs used in chemotherapy are divided into five broad categories. Drugs are placed in these categories depending on how they function in the destruction of cancer cells. More specifically, the drugs are classified into a specific category depending on what part of the cell cycle the drug interrupts. The categories are Alkylating Agents, Nitrosoureas, Antimetabolites, Antitumor Antibiotics, Plant Alkaloids, and Steroid Hormones. ALKYLATING AGENTS are drugs that work by directly attacking the DNA of a cell. These drugs can work at any time of the cell cycle, but are most effective during DNA synthesis. They are used to treat Hodgkin’s disease, lymphomas, chronic leukemias, and certain carcinomas of the lung, breast, prostrate, and ovary. Alkylating agents are administered either orally or intravenously. Examples of drugs in this category are Cyclophosphamide and Mechlorethamine, Cisplatin (Platinol). 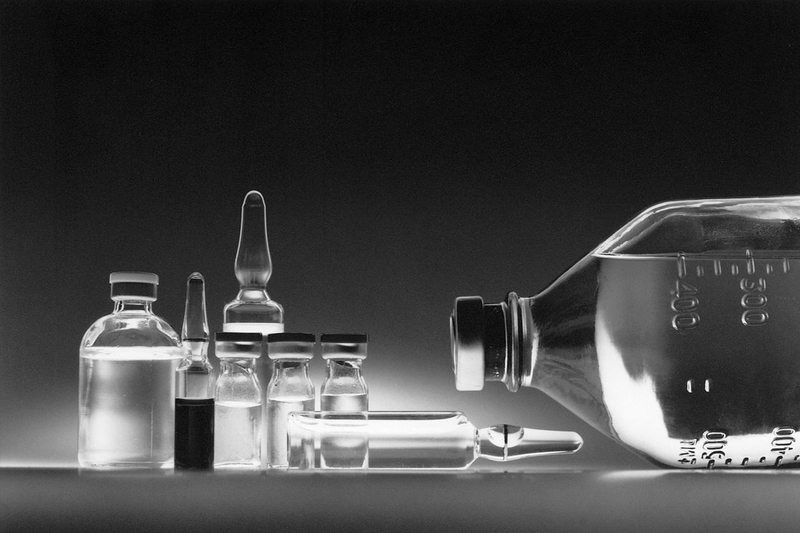 Read a very detailed history of platinum based drugs (Cisplatin) and their method of action and use. NITROSOUREAS are similar to alkylating agents, and work by inhibiting the changes necessary for DNA repair. A very important feature of this class of drugs is that they can cross the blood-brain barrier which makes them very useful for treating brain tumors. They can also be used to treat lymphomas and melanomas. Nitrosoureas are administered either orally or intravenously. Examples of drugs in this category are Carmustine and Lomustine. ANTIMETABOLITES block cell growth by interfering with DNA synthesis. These drugs work by mimicking a substance involved in DNA synthesis, inhibiting production of an acid necessary for DNA to be synthesized. These drugs affect the “S” phase of the cell cycle. Antimetabolites are used to treat tumors of the gastrointestinal tract, breast, and ovary. They are administered either orally or intravenously. Examples of these drugs are 6-mercaptopurine and 5-fluorouracil. ANTITUMOR ANTIBIOTICS work by binding with DNA to prevent RNA synthesis. These also prevent cell growth by preventing DNA replication. Antitumor antibiotics prevent the DNA from reattaching itself together which causes the cell to die. This category of drugs is used to treat a wide variety of cancers including testicular cancer and leukemia. Antitumor antibiotic drugs are administered intravenously. Some examples of this category are Doxorubicin and Mitomycin-C.
PLANT(VINCA) ALKALOIDS work by preventing cell division. During metaphase, mitotic spindles hold the two sets of DNA the cell needs to divide. The spindles are formed using a protein called tubulin. Plant alkaloids bind to tubulin, which prevents the formation of mitotic spindles. Without mitotic spindles, the cell cannot divide. These drugs are derived from plants and are used to treat Wilm’s tumor, and cancers of the lung, breast, and testes. Plant alkaloids are administered intravenously. Some examples of this category are Vincristine and Vinblastine. STEROID HORMONES. These drugs modify the growth of hormone dependent cancers. They induce a change in the three dimensional shape of the receptor on a cell preventing the cell’s binding to the needed estrogen response element on the DNA. These drugs are most commonly used in treating breast cancer. The hormones are administered orally. Some examples of this category are Tamoxifen and Flutamide. The administration of chemotherapy can be accomplished in several ways. The most common means are oral and intravenous, but chemotherapy may also be administered intramuscularly or through catheters. The oral form is when the drug is in capsule or pill and is taken through the mouth. Oral administration is very convenient, since all that is required is for the patient to swallow a pill. The intravenous form, or IV, is when the drug, in liquid form, is introduced directly into the bloodstream through a small needle that is usually inserted in the arm. Intramuscular administration of chemotherapy is administered through an injection directly into the muscle tissue. It is much like receiving a common shot. Chemotherapy agents injected into the muscle tissue disperse more slowly into the body than if they are given by an intravenous method. Catheters are also used in chemotherapy. A catheter is a thin plastic tube that is inserted into one of the central veins and usually left in place during the course of treatment. The benefit of a catheter is that the patient always has a device to receive the chemotherapy and eliminates the need for multiple needle insertions every time treatment is needed. Catheters may be chosen for patients that have small veins, or have few easily accessible veins. Chemotherapy is very effective in killing cancer cells, but it also affects normal cells as well. The strength of the drugs used in chemotherapy causes side effects that can bring discomfort and inconvenience. Typical side effects of chemotherapy include gastrointestinal tract problems, hair loss, low blood cell counts, skin rashes, fatigue, and infertility. Some will be covered here, but be sure to talk with your treating physician about the potential side effects of the drugs you may be given. Most side effects are manageable, and if they become problematic, there is medication to treat them. Gastrointestinal problems are those related to the esophagus, stomach, intestines, colon, and bladder. The potency of the chemotherapy can lead to nausea, diarrhea, constipation, and loss of appetite. Mouth sores and a sore throat may also be experienced. Healthy cells die or are damaged along with the cancer cells, causing these temporary problems. When the chemotherapy has been completed, the non-cancerous cells return to their normal functions, or are replaced by new healthy cells, and the symptoms cease. Another very important side effect can be problems in the bone marrow. The marrow is the place where red blood cells, the white blood cells, and platelets are created and mature. Chemotherapy affects these rapidly dividing cells much like it affects cancer cells, and many blood cells die. The decreased output of any of these cells can lead to problems. Decreased production of healthy red blood cells, which carry oxygen, can lead to anemia. A decrease in white blood cells, cells that fight diseases, can lead to infections since without them, the body cannot fight pathogens and disease. A reduced number of platelets impairs the clotting ability of the blood, which in turn slows healing from injuries. The doctor routinely monitors the count of all these cells during treatment, and will take precautionary measures if any problems occur. Hair loss can also occur with chemotherapy. Hair loss occurs because the chemotherapy affects the constantly growing hair follicles. The drugs cause the follicles to stop reproducing, bringing hair growth to a halt. In addition to this, the weakened follicle is no longer able to support the hair strand coming out of it. The hair strand then either breaks off or falls out due to lack of support. The hair will grow back when the chemotherapy has stopped, and usually the hair grows back the same if not thicker than before. Sexual side effects can also occur because of chemotherapy. The effects can be seen in a low sperm count or damage to the ovaries. The cause is again because chemotherapy drugs are targeting rapidly diving cells, and those in the testicles and ovaries fall into this category. It is possible for the drugs to produce temporary or permanent infertility in both men and women.